Identipet (Pty) Ltd. wishes to stress that the following problem does not in any way apply to, nor reflect on Identipet microchips. 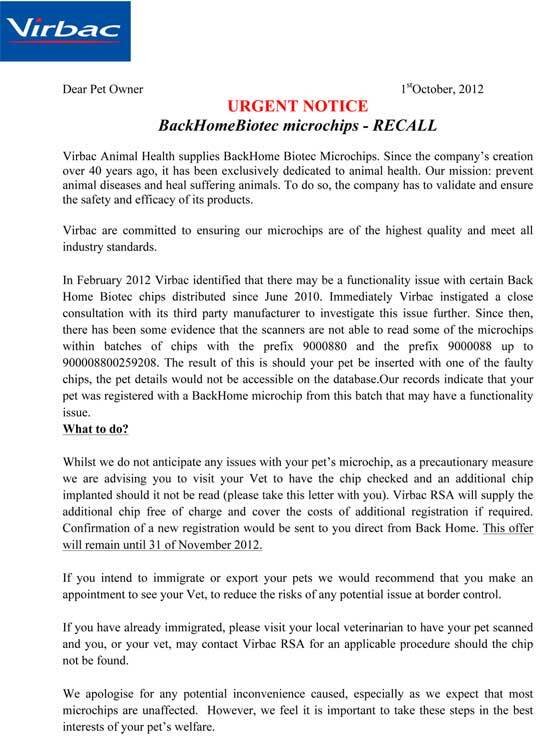 URGENT NOTICE issued by Virbac Pharmaceuticals with respect to the recall of their potentially faulty Virbac Biotec BackHome microchips. Identipet (Pty) Ltd needs to inform and reassure all Welfare Organisations, Veterinarians, Veterinary bodies and publications, as well as breeders and pet owning members of the public that the problems which necessitate the microchip recall are specific, and refer only to BackHome Biotec microchips which are supplied by Virbac and NOT by Identipet (Pty) Ltd.
Identipet (Pty) Ltd has for over 27 years supplied only tried and tested products of the highest quality, to hundreds of thousands of satisfied pets and their owners.